Cold-brew coffee concentrate is something I first heard of decades ago from a doctor I knew who was a coffee aficionado. He was very particular about his coffee and didn't have time to make it properly for himself during the workday and didn't believe that anyone else could. So he made coffee concentrate at home and kept a bottle in his office refrigerator. With it he could have a cup of excellent coffee in no more time than it took to heat the water. I'm not a coffee drinker, but I can enjoy a cup or two on those occasions when I make it for guests who are. And I use it in cooking and baking. Since regular coffee does terrible things to me (though the caffeine in tea does not bother me at all), I always use decaffeinated (organic, fair trade) coffee. My preferred brewing methods are pourover and French press. 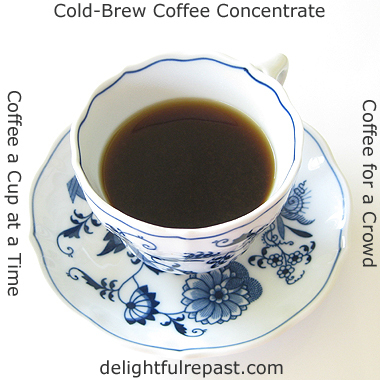 If, like me, you find making pourover or French press coffee for a crowd a bit of a pain, you'll love using cold-brew coffee concentrate. If you have an iced coffee habit, it could quickly break the budget; but not if you make your own fancy iced coffee drinks at home. With your own stash of coffee concentrate, your favorite add-ins and plenty of ice, you'll save a lot of money. To make this amount of cold-brew coffee concentrate, you'll need some version of the following: 4-cup glass measure, 2-cup glass measure, strainer, pint jar, stainless steel filter (or unbleached paper filters) and filter holder (dripper). Just see what you have in your kitchen that will work. I just happen to have the stainless steel filter because someone gave it to me. I imagine you could put an unbleached paper filter or piece of cheesecloth in a large strainer and set it over a bowl. I'll leave it to you to decide how much concentrate to use for various purposes, but I think one part concentrate to three parts hot water makes a great cup of coffee. Of course, tea drinker that I am, most of my coffee concentrate will be going into things like Brownies, Brownie Bites and Coffee Chocolate Gelato. Do you like coffee? Hot or iced? 1 In a 4-cup glass measure or pitcher, stir together coffee and water; cover. Let stand at room temperature for 18 hours. 2 Strain into a 2-cup glass measure. 3 Put a stainless steel filter, or a wet paper filter in a filter holder (dripper) or large strainer, over a pint jar or another 2-cup glass measure. Pour in the strained coffee. When dripping stops, remove filter, put a lid on the jar and store it in the refrigerator for up to 2 weeks. I am not a coffee drinker either, but this coffee concentrate could be great in baked goods too. Thanks, Angie. That's what I'm using it for. Put a tablespoon in some brownies yesterday. That's why I just make a pint at a time. M-mmm. Who said that? Wasn’t me. OK, it was me, but I do avoid coffee. Don’t want to stimulate the caffeine beast in me (yes, it could be decaffeinated, but the taste buds are still seduced, plus I like the caffeine kick). Save my quota for chocolate! Coffee flavored yogurt and coffee flavored ice cream are also on my wish list. Funny, because I drank coffee between the ages of 3-6. This was in Argentina, and I didn’t like coffee when we moved back to the States. Not sure why the South American coffee was different, but that was true of a lot of foods. In any case, your version sounds delectable. Thank you, Sully? Yes, I love to put it in my coffee gelato! And in chocolate ice cream (and other chocolate things). Even in so small an amount that you're not really tasting the coffee, it really enhances the chocolate flavor. That's the first time I read such a recipe, it sounds so interesting to me, darling Jeanie ! Even if I'm Italian I'm not a coffee drinker and anyway the only coffees I've always drinked, also abroad, are 'expresso'... I use to drink coffee when I get tired and I need a little of ...'charge' and to wake up in the morning, especially if it's very early ! Dany dear, thank you! You would probably, like me, use it in baking and gelato rather than drinking it. Wishing you a joyous day, too! Hi Jean!Your post is very interesting,but I'm afraid I wouldn't like coffee this way...My husband and I use to drink coffee every morning,before going to work. It's almost a tradition here drinking a drip coffee !Love your teacup!Thanks for sharing!Maristella. Wow, what an interesting post and recipe! I'm not a coffee drinker at all, but my husband would love this! Maristella, I haven't done any side-by-side comparisons of coffees made by the different methods. But I know when you have a tradition, you don't want to change it. I'm that way about tea! Thank you, Mayflower! Let me know if he tries it! Mr Shoes is the coffee drinker in this house, downing up to 16 cups a day, and don't bother to try to slow him down because I've spent the last 30 years trying. He's not particular either - the man will drink GAS STATION coffee. The only coffee I have interest in is Irish (on occassion). Mrs Shoes, that's astonishing! He doubles my tea habit! We cherish ONE cup of regular coffee at breakfast. We purposely use just a plain, cheap coffee maker (don't want to get addicted to something REALLY good!) This would be handy to add to recipes. Always fun to learn something new from you. How interesting! I've never acquired the taste for coffee, although I do like the scent and enjoy coffee-flavored desserts. Thank you, Mildred! I like your reasoning! :D Sort of like me, when I have the urge to bake something, but I don't want to be eating any sugar, so I bake something chocolate (which I can take or leave) for my husband! Margie, I agree. I've always thought it smells better than it tastes as a beverage (we'll stick to our tea, won't we?!) but is wonderful in desserts. I love a good cappuccino and a cup of coffee in the morning. I have a Starbucks on my corner and I noticed people raving about the cold pressed coffee. Thanks for the recipe I will definitely try it. Thank you, Gerlinde. Let me know how you like it. I love it for recipes because it was always a pain making a small amount of strong coffee every time I needed it for a recipe (I put it in nearly everything chocolate). I have a coffee in the morning and then switch to tea. This was interesting on how to have fresh tasting coffee throughout the day - I'll bet this would be great for camping. Judith, what a great idea! I have several friends who do a lot of camping; I'll be sure to tell them! I am a coffee drinker but for the past few years, I've been drinking tea in the morning. We do stop by that super expensive coffee shop and I've seen where they offer "cold-brewed" coffee. That is an expensive habit plus if I do drink coffee late in the day I can just as well plan on staying up all night. BUT!! your recipe for cold-brewed coffee sounds so interesting I'm going to make it!! Can I just use my French Press for all of this? Have a nice weekend. Too funny, Judy! I hope you clicked right over to the Coffee Chocolate Gelato! This is very interesting. My first thought was Camp Coffee. My second thought was my grandmother always kept a bottle of Camp Coffee. Is this the same thing, Jean? Camp Coffee is a Scottish invention first produced in 1876 by Paterson & Sons Ltd. in a plant on Charlotte Street, Glasgow. Here is a BBC link. They thought it important enough to include in their History of The World. All the best, Tony. Hope you and Mr Delightful are well. I am so glad to see this recipe. I have been drinking iced coffee daily and the concentrate I buy is very expensive! I'll be making my own! Tony, thank you for sending that link! I had not heard of Camp Coffee. I see it has chicory and sugar in it as well as coffee extract. 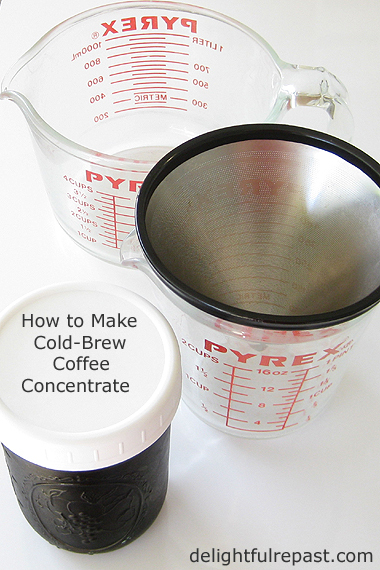 The typical cold-brew coffee concentrate is just coffee and water. But you could add anything you like to it. I wonder if my Scottish great aunt (by marriage) born in 1886 ever used Camp Coffee. Cathy, I'm glad I could help! And you don't need to buy a $130 cold-brew machine to do it! What a fantastic idea! I have never heard of coffee concentrate. I guess I need to get out more. I always have to have my coffee in the AM and I can drink it in the middle of the night and it doesn't bother me a bit. My mother brewed a pot of coffee every Saturday evening and let my little brother and me have some with lots of cream and sugar. It was such a treat! Her tea was horrible because she let it boil away on top of the stove and it was too strong. Hence, I never drank tea at all until I discovered a whole world of tea and flavours at a tea shop. I have enjoyed it ever since. I don't like strong tea or coffee and I take both black. 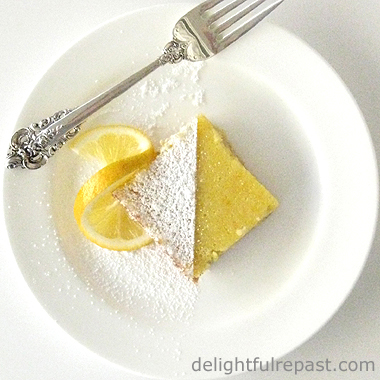 Although I do like a slice of lemon in certain kinds of tea. This recipe would come in handy for so many things. Thanks for sharing, Jean, and enjoy your weekend. Thank you, Sandi! And thanks for sharing your coffee and tea history! Most people I've known who don't like tea have had the opposite problem -- they've only ever had horribly weak tea made from dunking a teabag in a cup of tepid water a few times. I'm like you, Jean, and drink coffee every great once in awhile, but it just doesn't make me feel well. However, it was nice of you to share this method for those coffee lovers out there! Happy weekend to you, Jean, and enjoy a cup of tea! Thank you, Kitty! Yes, I'm enjoying a cup of tea this very minute. Sure nice to have this concentrate on hand for when a diehard coffee drinker drops in! I was so interested to read this post, Jean. I've been hearing so much about cold brew coffee! 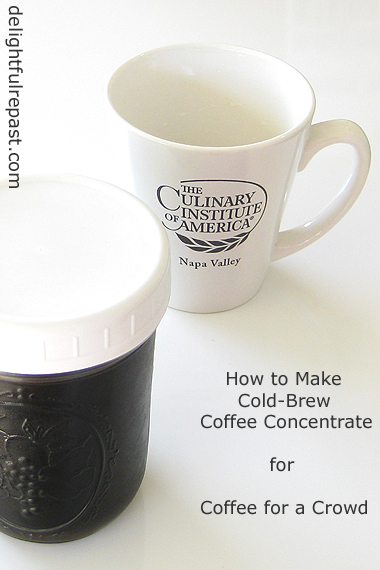 I really like the idea of this cold brew concentrate. Thank you so much for sharing it with us at Hearth and Soul. April, thank you! I use coffee in my chocolate recipes a lot, and this is a lot more convenient than brewing it a bit at a time; and I found espresso powder hardened into a lump no matter how tightly I closed the container. This sound so good, Jean. I would like to try it but sometimes my tummy isn't happy when I drink coffee now and even worse it doesn't always appreciate a cup of tea either. Oh dear! Unthinkable, huh. I am giving it a break and then will go back to tea first and maybe later try coffee. If I think I can try a cup of coffee I will definitely try this!!! It would be good in recipes though and that I could do. I bet my hubby would like it, too. Okay, I will have to get some freshly ground coffee to use and go for it. I'll let you know how it goes. Dear Lily, I am so sorry you're having tummy trouble. I don't know if coffee bothers my stomach or not because I rarely drink it, and when I do it's a single small cup of decaf. But if tea ever starts bothering me, I'll be in serious trouble! :-) I've been loving the oven method for rice; so glad you told me about making my Mexican rice that way! Totally breaking the bank on coffee. But the thing is, I don't have a coffee press, or anything to make coffee with! But I really should buy something. Good investment in the long run. Cathleen, it really doesn't take much, as you can see here. Not a big investment at all. Will pay for itself in no time! Thanks, Annette. I hope he tries it! Let me know how he likes it. I have a couple of coffee drinkers coming Tuesday evening, so I'm going to see how they like it! As you know, Jean, I AM a coffee drinker...and a coffee snob at that! I was 1st introduced to cold brew coffee as a 'Tody' that was easier on the stomach because the cold brew method reduced the acid. I have a cold brew (simple) contraption that I haven't used in a while, but thanks to you....I'm pulling it out and making a batch! Cold brewed is smoother in taste. I don't think you need a lot of expensive equipment to make a good cup of coffee. You need to fresh grind the coffee for each batch, and keep the coffee tightly sealed when stored. If you use cream, use organic full fat (whipping) cream and add the coffee to the cream. These are little secrets I learned over the years as I peppered my favorite coffee makers with questions. Thanks, Sue! I appreciate your expert tips. I don't have much experience with coffee, but I did see that the cold-brew coffee seemed smoother. I'll have to experiment next time with the cream-first or coffee-first and see what I think. This is a good idea...However, I am not a cold coffee/tea drinker. I prefer it hot as it exhibits better for your body. Thank you for the ideas and thanks for taking time to visit! Chris, I prefer coffee and tea hot as well. With this, though the concentrate is cold, you use one part concentrate to 3 or 4 parts boiling water, so you have a nice hot cup of coffee. What a great idea. Thank you for sharing on the Celebrate 365 Father's Day Party. I do hope you will join our new Patriotic Party that is live today. Thanks, Nicole! I need to make another batch. Used the last of this one on a chocolate cake.